In the early 1900s, appropriate dress was easy to understand. Dress codes were simple, and the tuxedo and tailcoat were known as the great equalizers for their ability to make all men, regardless of rank or fortune, appear appropriately attired for evening affairs. Whereas, the morning coat or stroller coat were appropriate for events during the day. Today, there are a multitude of dress codes with new ones popping up all the time. No longer is it formal, white tie, black tie, casual, or business attire. Now there is black tie optional, black tie alternative, smart casual and a plethora of other names making it difficult for the guest and host, to understand what each term really means. Now, when we examine dress codes, there are really three main categories with various subcategories. The main types are formal wear, business attire, and casual wear. We’ll start with the most formal and work our way down to most casual. If the invitation calls for white tie or morning dress, you can be certain that the affair is as formal as it gets. Unfortunately, these events are few and far between, so unless you’re a Freemason or a close friend of royalty, you’re likely never going to need a tailcoat. Just as the tuxedo is reserved exclusively for evening affairs, the tailcoat is another outfit only worn in the evening. For daytime events that require formal dress, a morning coat is an equivalent to white tie. This is about as formal as current events get. Even events held at The White House typically only require black tie. Black tie means a tuxedo. A dark business suit and tie will not suffice so if you don’t have a tuxedo, you need to invest in one or find a good rental – though we recommend the former. If you live in tropical climates or for events in the summer, you can opt to wear a white dinner jacket instead of the traditional tuxedo. However, it’s important you know how to pull off this look, so you don’t end up looking like the wait staff. For daytime events that call for black tie, you should opt for a stroller suit and reserve a tuxedo for the evening only. Creative black tie dress codes are quite common these days. It is a dress code especially popular for formal Halloween and holiday parties. While it typically still requires a black or midnight blue tuxedo, you can take many “creative” liberties, including ditching the tux and opting for a burgundy suit or adding some sprezzatura by incorporating an interesting bow tie, accessories, shirts or shoes that some may consider more trendy. This is a dress code often used for civic or corporate events and fundraisers where they don’t want to alienate those who don’t own formalwear. If you see the BTO dress code on your invitation, it means that if you don’t have a tuxedo, you are welcome to wear a dark business suit with a conservative shirt and tie. Semi-Formal is often found in the United States and consists of a dark business suit with a white dress shirt and conservative tie. Unlike the BTO dress code, you should not wear a tuxedo, even if you have one. You might also hear this called Cocktail Attire. This is what you wear to your most important boardroom meetings. It means a dark business suit, a white dress shirt and a conservative tie with dark shoes. This is arguably the most popular and misconstrued dress codes. It does not mean wearing denim jeans and a t-shirt. What it does mean is wearing a blazer with dress trousers, chinos or corduroy pants. You can wear an open-collar or polo shirt and a pair of loafers, drivers or another casual shoe. LET’S DISCUSS: Can jeans and a blazer be business casual attire? Dressy casual is a slightly more formal version of business casual. What this means is opting for an oxford button down over a polo shirt and pairing it with a more conservative navy or tweed blazer and dress slacks. You still don’t need to wear a tie unless you want to. This is where you can start welcoming denim jeans with open arms. This dress code lets you wear a casual trouser such as jeans, khakis or chinos with a sport shirt or polo shirt and an unconstructed sports jacket. Men, please stop assuming this means sweatpants and hoodies. It doesn’t. 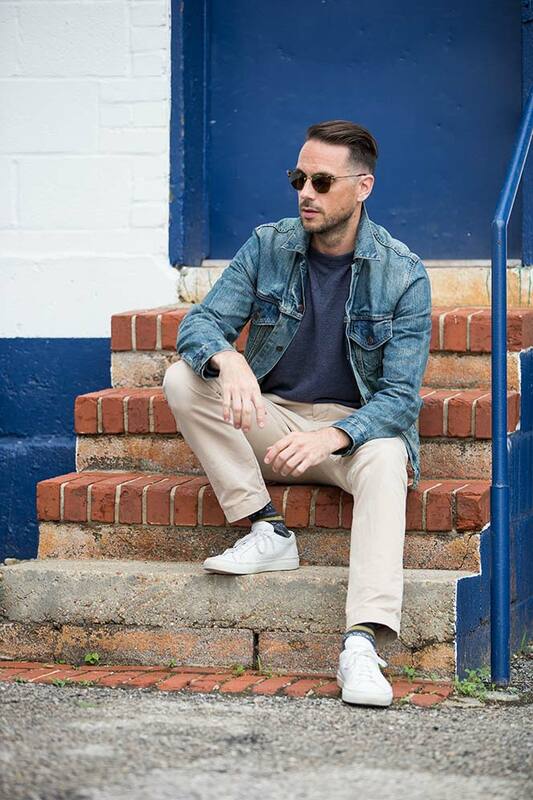 Casual attire worn outside of the privacy of your home means casual pants like well-fitted jeans, khakis or chinos with a more casual shirt or sweaters such as a v-neck or cardigan. You can add sneakers, boat shoes or loafers. When you hear casual, think of what you might wear to a barbecue at your future in-law’s house who you’ve only met once. Im quik to suit up but I think I definetly fail when it comes to the Casual wear. I needed to hear this. Thanks Brian. I just got an invitation that says “elegant attire” which seems to mean, according to my internet search, something along the lines of semi-formal. I think it may be a little more flexible on the suit than business formal or semi formal – i.e. it could be something slightly more casual/fun/less formal than a dark business suit. Like most of the looks you’ve posted here. But the Black Tie Optional—with the black shirt and black tie?—wake me when it’s over. Unfortunately, a lot of people in business today, who should know better, think that business casual is the denim/t-shirt/sneaker nonsense. I recall being told that an event would be “business casual” and that it would include doing some community service stuff that involved dirt, plants and garden tools… That is NOT a business casual event! Since the Director was the one doing the inviting, I didn’t feel I could make any corrections to what they thought they were telling us to wear. But wow. Just wow. BTW, I wore a seersucker with white polo, driving shoes and a straw fedora… I also didn’t do any garden digging. LOL!